Right click on any irush buttons or input fields for context-sensitive help. 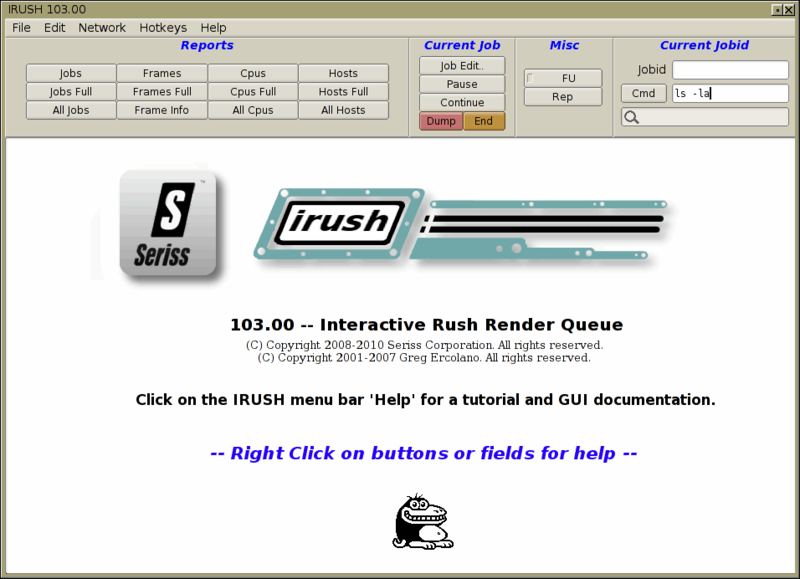 Irush is a job control and monitoring tool. You supply irush a jobid to control, and its interface will let you manipulate that job easily. An important thing to remember is: the Jobid in the upper right corner of the irush screen is the current job being controlled. By default, the Jobid is empty; you can either type in the jobid, pick it from a list of jobs, or invoke irush with the jobid on the command line. For instance, hitting 'Frames' or 'Cpus' (in the upper window) will list the frames or cpus for the current jobid. Same for 'Pause', 'Dump', and 'Job Edit' buttons in that button grouping. 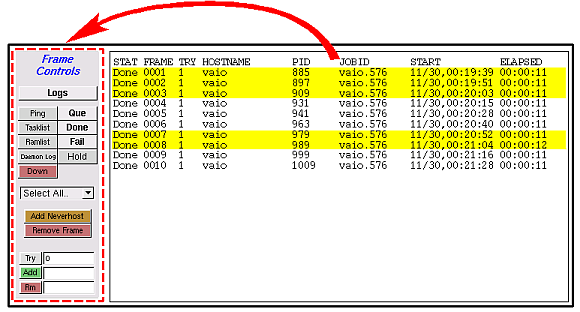 ...this example shows a frame list with several frames highlighted. Hitting any of the controls to the left will affect the highlighted frames. The controls are empty if the data being displayed in the window is not recognized by irush, such as occurs if you hit the CMD button to get a directory listing. Here's an animated tutorial that shows how to select jobs, requeue frames, and monitor your frames' error logs. Short tutorial on how to use irush. This is a large gif; you may want to let it completely load before watching. Supply the jobid on the irush command line. If irush is already up, just enter the jobid in the Jobid window. List all jobs, and pick one of them. This is sometimes the easiest. 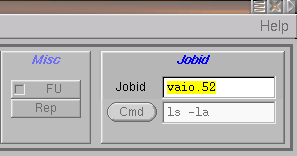 If you already know the jobid, just type it in the Jobid window. Click on either 'Jobs' or 'All Jobs' to get a jobs report. 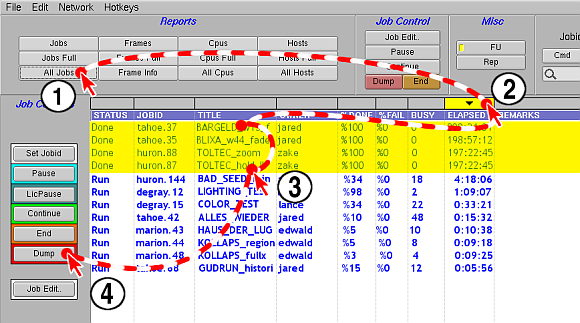 Double Click the job you want to monitor. The jobid will appear in the 'Jobid' window, just as if you had typed it. With a jobid set, the buttons in the upper window will affect this job. For instance, hit 'Frames' to see the job's frame list. The frame list shows the status of each frame, the hostname it ran on, and the start time and elapsed time for each frame. Each time you hit the Frames button, you'll get an updated report. Use the Repeat button to have the report automatically update. With a frame report on screen, you can select certain frames, then use the frame controls (that appear to the left of the report) to modify the frames. For instance, you can requeue frames with the 'Que' button. Highlight some of the frames in the report by clicking them. 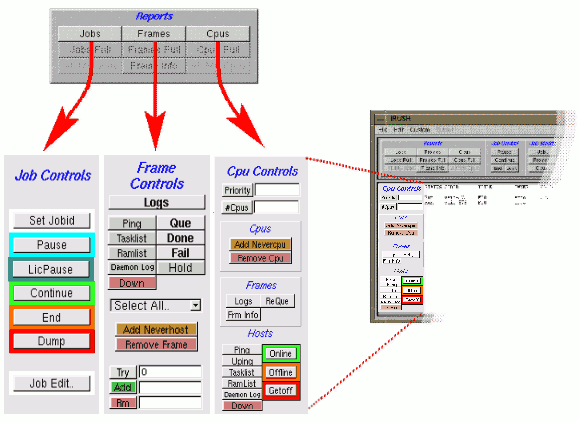 You can also click and drag to select a range of frames, or hold down the Ctrl key to toggle-select. To select all frames in a particluar state, you can use the Select All... pulldown menu. Click the 'Que' button under the frame controls. This will cause the selected frames to be requeued, and an updated report will be displayed. To dump only the job you're working on, you'd just use the 'Dump' button in the middle of the screen, which dumps the job shown in the 'Jobid:' window in the upper right of irush. All the buttons on the left side of the screen affect the jobs you have highlight, so besides dumping all the jobs, you can Pause, End, or Continue them. 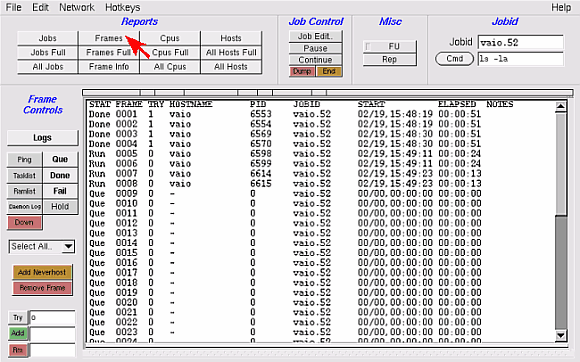 Note that you can highlight several jobs at a time by dragging the mouse, or hold the CTRL key down and click on several jobs to accumulate several individual jobs. You can sort jobs by any column; see Sorting. You can also limit reports using the search filter. Dumping old jobs based on elapsed time. Dumping jobs owned by "edwald". If you're not the owner of some of the jobs you're dumping, errors will show in the gray window after you choose 'Dump'. To dump other people's jobs, you'd need to have the "FU" button enabled. Any error messages will appear in the gray window after you hit 'Dump'. In some situations, your systems administrator may disable the FU button, or limit its use to certain users. See the error message for details.